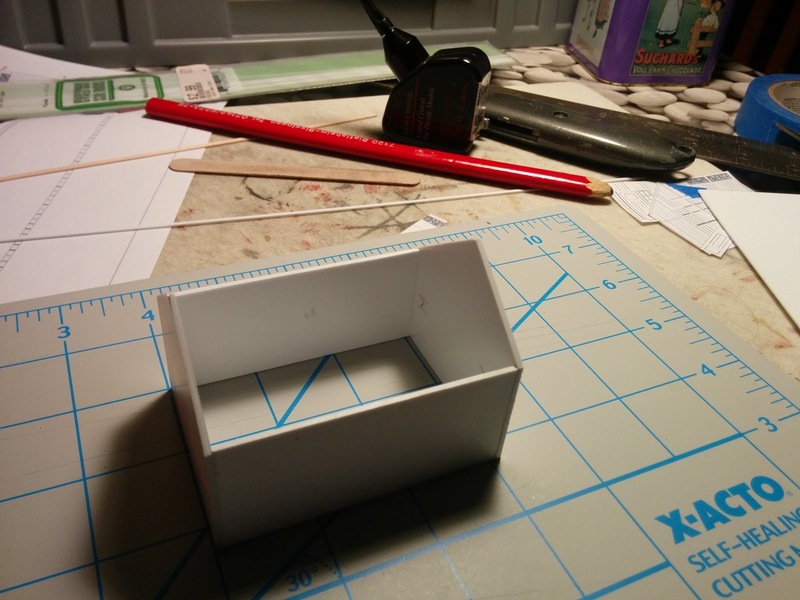 This is my first time, that I build a model completely from scratch, in this case styrene sheets and strips. 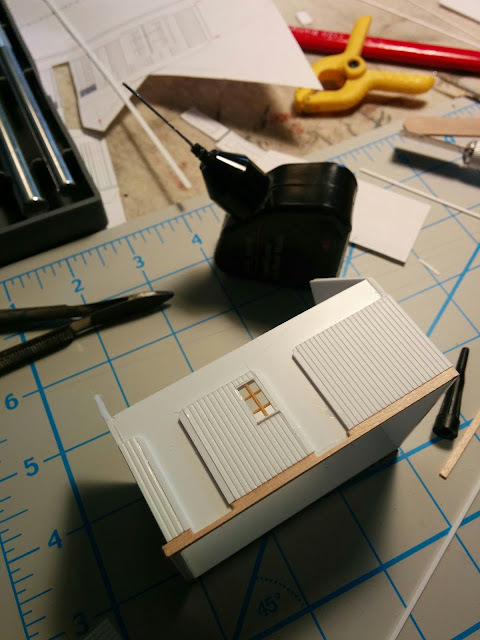 While I'm really enjoying myself building this model, I can see why people that scratchbuild regularly have a stash of doors and windows. They take forever to build yourself and the result is at best acceptable, unless you are really good (not me), or going for the shabby look with odd angles and pieces that barely hold together. ... and glued them to a box. This is a sturdy base for gluing the outer walls and building doors and windows. 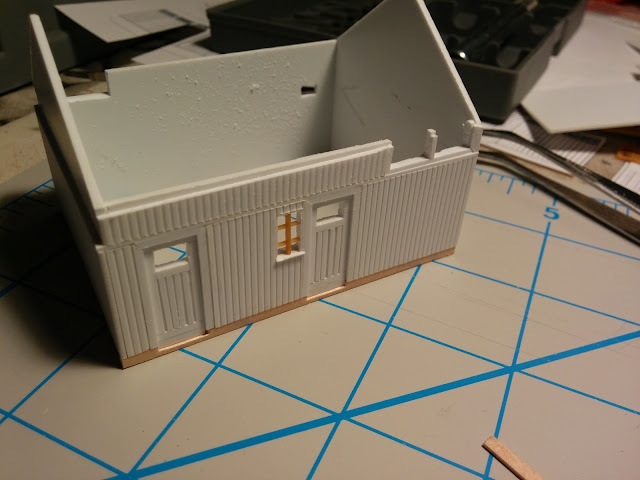 I started with the rear wall, which has only one door, to make the inevitable mistakes face the backdrop, instead of laughing into my face every time I turn on the light in the layout room. I use basswood strips for the foundation, since these strips are a tiny bit thicker than the styrene siding, giving the foundation a bit more heft. 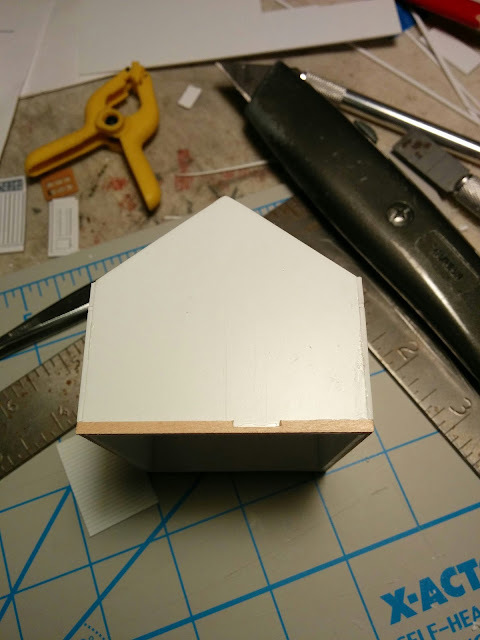 The door is made from various width of 0.010" Evergreen strip styrene (0.080" for the kickboard at the bottom, 0.060" for the door panels, and 0.040" for the groove pattern below the window). The door frame is made from 0.040" x 0.060" strips. 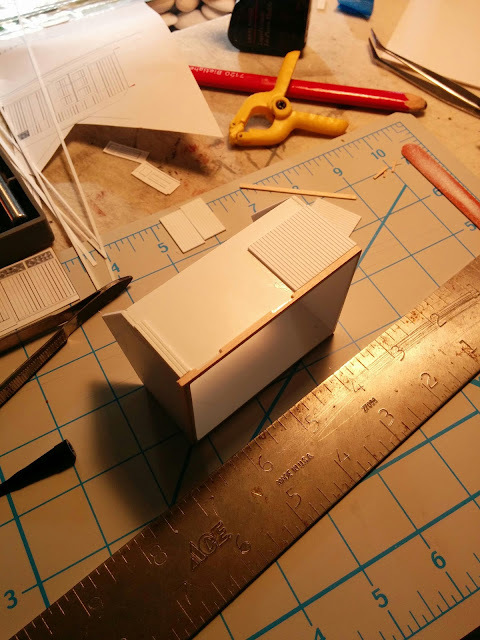 The other reason I cut the siding in multiple pieces is the horizontal board (0.030" x 0.040" strip) that sits between the door and the skylights just below the roof. By the way, this is the door to the ladies restroom. This is state I left it at late yesterday evening. Today, confident that I have an idea what I'm doing I started with the front wall. Two doors. One window. 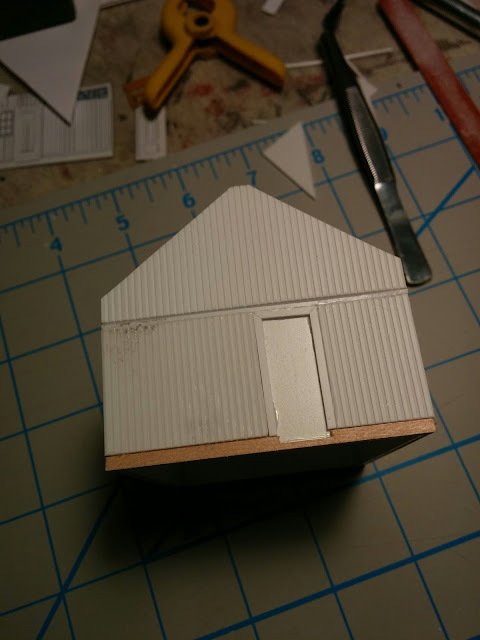 Cutting and fitting the siding was straight-forward. After lots of swearing, tooth gnashing, and generous application of drills, knifes, and a square jeweler's file, the window was set in place. 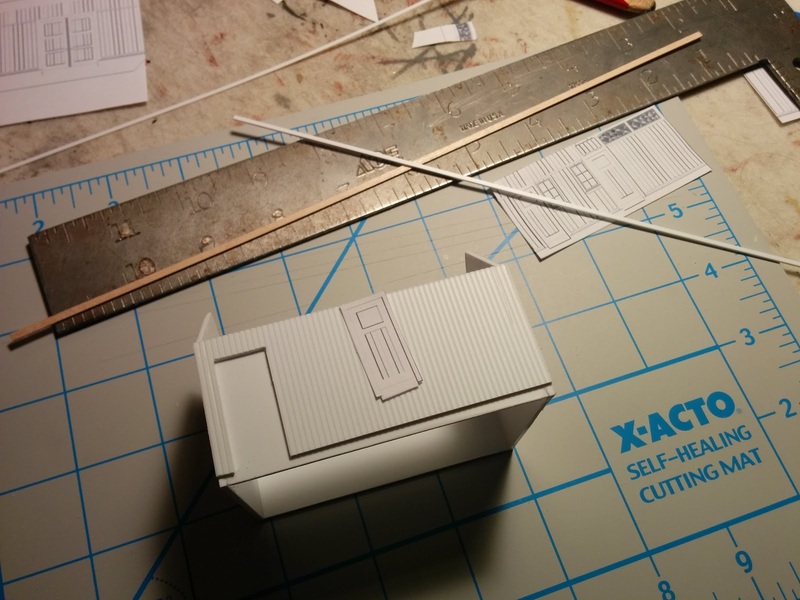 By now I have the process down for making doors. 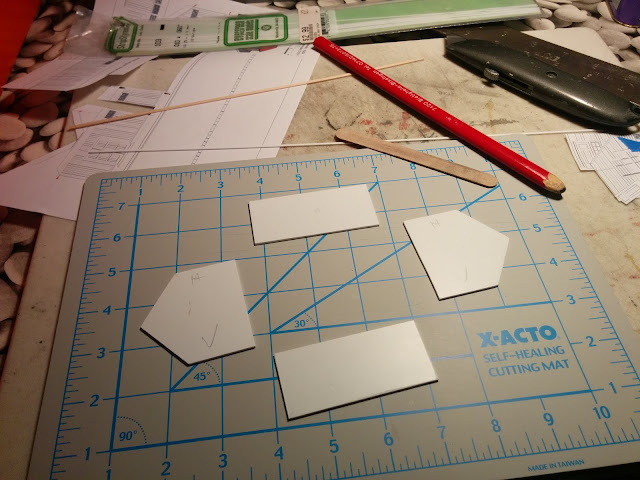 The NWSL Chopper yet again proofed its worth for making exact length, square cuts, and cuts at 45 degree angles. Here's the completed front wall. The door on the left leads to the wood storage room. The door in the middle accesses the train lamps storage and work shop. The worker even gets some daylight through our shiny new window. The skylight on the right is for the men's urinals. Here's the blank canvas of the last wall. I already glued the foundation strip in place. A while after I took the photo I noticed that I glued it on backwards and the door is now on the wrong side of the center line, and we'd walk straight into the men's toilet, instead of the room with the urinals. Oh well, had I not told you, you wouldn't have noticed, right? The lower siding and the door frame are glued in place and and the upper siding is ready for cutting the skylights to the urinals. Yep, in addition to their toilet, the gentlemen get space for urinals that is at least three times the size of the single toilet room the ladies have. AND, they get 4(!) fancy-shmancy skylights. I guess around 1900 more men worked on and traveled by rail so the imbalance maybe even makes sense. Alright, it's late enough. 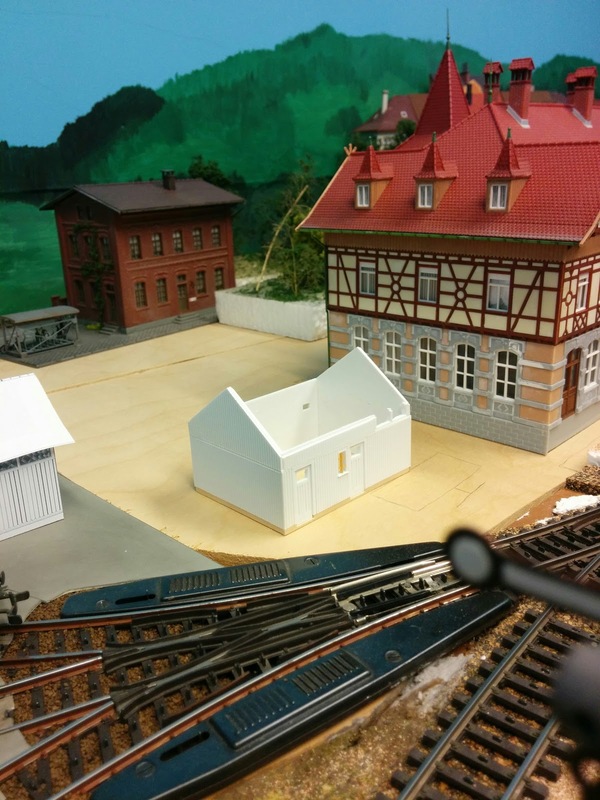 I won't finish the last wall today, but here's a quick peek at what the raw, unfinished building looks like on the layout. 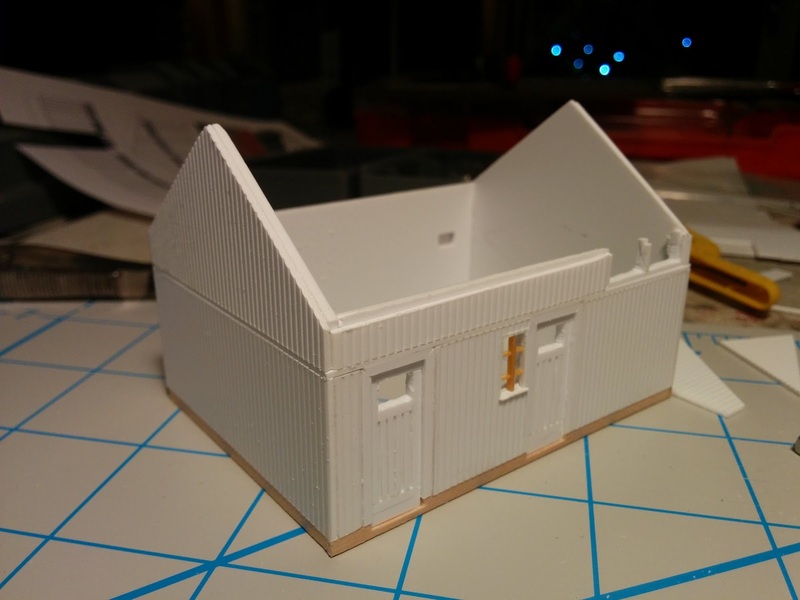 I'm definitely in the "scratch built, but with commercial doors and windows camp." I can make doors, but never got the hang of windows with thin mullions. 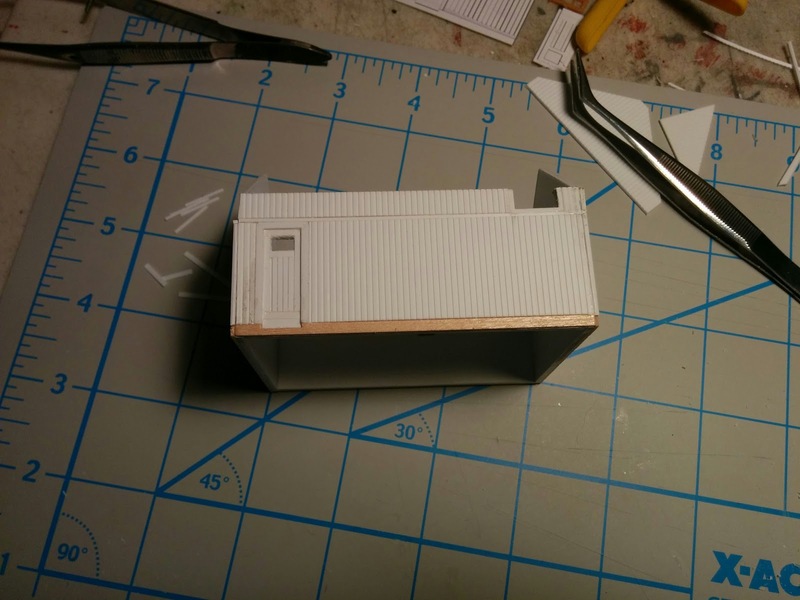 Freight doors, however, are easy to scratch build. They're also a great place to add a little unique detail to each model; I've seen odd and interesting patterns on cross-bracing, doors sheathed in metal, or doors hung from tracks. Very much agreed. You can certainly add some flair to a building with relatively little effort.